Disclaimer :- I have researched the names of the men and boys below who are named on the Memorial (but sadly they are only recorded with a surname and an initial), with the Commonwealth War Graves Commission website, so I apologise in advance if any are wrong and would be very grateful for any information on the ones that I cannot find on the CWGC website, even a very small clue. The one with –Guess – after the name is because that is the only name that coincided with the name. I will now start my research as and when more documents are released. Please contact the flintshirewarmemorial.com website. BROUGHTON, Louis (Loui Deiniol) – Guess – Second Officer S.S. Dotterel (Liverpool) Merchant Navy Died 7th March 1941 age 29 years. King’s Commendation for Brave Conduct. Husband of Breda R. Broughton, of Vancouver, British Columbia, Canada. Commemorated at Tower Hill Memorial, Location: London, United Kingdom. DAVIES, Frank Gunner 145441361 Anti-Tank Regt. Royal Artillery Son of Arthur and Florence Davies, of Hawarden, Flintshire; husband of Winifred Davies, of Hawarden. Died 6th November 1942 age 32 years. Buried at Alexandria (Hadra) War Memorial Cemetery, Location: Egypt. EVANS, Alfred Private 6096134 4th Bn. The Buffs (Royal East Kent Regiment) Husband of E. Evans, of Hawarden, Flintshire. Died Between 23rd October 1943 and 24th October 1943, age 27 years. Commemorated at Athens Memorial, Location: Greece. GILBERT, Joseph E. (Joseph Edward) Leading Seaman P/JX 285384 H.M.S. Quorn Royal Navy Son of John and Emily Gilbert, of Shotton, Cheshire. Died 3rd August 1944 age 36 years. Commemorated at Portsmouth Naval Memorial, Location: Hampshire, United Kingdom. HARMES, George (George Edwin) Sergeant 1547702 466 (R.A.A.F.) Sqdn. Royal Air Force Volunteer Reserve Son of George Edwin and Alice Harmes; husband of Betty Harmes, of Ewloe, Flintshire. Died 17th May 1943 age 21 years. Commemorated at Runnymede Memorial, Location: Surrey, United Kingdom. HUGHES, David L. (David Leonard) Private 14428656 1st Bn. The Tyneside Scottish Black Watch (Royal Highlanders) Son of Harold and Frances Hughes, of Mancot, Hawarden, Flintshire. Died 1st July 1944 age 19 years. Commemorated at Bayeux Memorial, Location: Calvados, France. ***HUGHES, Patrick Private 14403536 7th Bn. The Parachute Regiment, A.A.C. Son of Peter and Lucy Hughes, of Mancott, Flintshire. Died 6th June 1944 age 19 years. Buried at La Delivrande War Cemetery, Douvres, Location: Calvados, France. OWEN, George T. (OWENS, George Thomas) Gunner 1444744 239 Bty., 101 Lt. A.A./Anti-Tank Regt. Royal Artillery. Died 8th June 1940 age 26 years. Commemorated at Dunkirk Memorial, Location: Nord, France. PARISH, David F.W. (David Woodbine) Pilot Officer 105172 236 Sqdn. Royal Air Force Volunteer Reserve Son of Lt.-Col. Francis W. Parish, D.S.O., M.C.,* and of Dorothy Parish, of West Brompton, London. His brother, John Neville Woodbine Parish, also died on service. Commemorated at Malta Memorial, Location: Malta. *Died in 1921, named on the WW1, Click on the link to read his story. PARISH, John N.W. (John Neville Woodbine) H.M.S. Heron. Royal Naval Volunteer Reserve Son of Lt.-Col. Francis W. Parish, D.S.O., M.C. *, and of Dorothy Parish, of West Brompton, London. His brother, David Francis Woodbine Parish, also died on service. Died 17th May 1941 age 20 years. Inscription – “His Brother David Pilot Officer R.A.F. (V.R.) Was Lost On Operations From Malta, 11th February 1942 Age 27.” Buried at Hawarden (St. Deiniol) Churchyard,Location: Flintshire, United Kingdom(West part.) *Died in 1921, named on the WW1, Click on the link to read his story. POWELL, Frank A. (Frank Alwyn) Assistant Steward M.V. Delius (Liverpool) Merchant Navy Son of Albert Victor and Elsie Powell, of Queensferry, Flintshire. Died 21st November 1943 age 20 years. Commemorated at Tower Hill Memorial, Location: London, United Kingdom. SALVONI, Raymond T.(Raymond Terence) – Guess – Flying Officer 155198 (D.F.C. ),35 Sqdn. Royal Air Force Volunteer Reserve Son of Lawrence and Charlotte Mary Salvoni; husband of Florence Dora Salvoni, of Radcliffe, Lancashire. Died 14th January 1945 age 22 years. Commemorated at Runnymede Memorial, Location: Surrey, United Kingdom. SHACKLETON, Arthur ) Bombardier 1427449 3 H.A.A. Regt. Royal Artillery Son of George and Alice Shackleton; husband of Priscilla Annie Shackleton, of Shotton, Cheshire. Died Between the 2nd March 1942 and the 3rd March 1942 age 29 years. Commemorated at Singapore Memorial, Location: Singapore. (Also on Connah’s Quay & Shotton War Memorial). 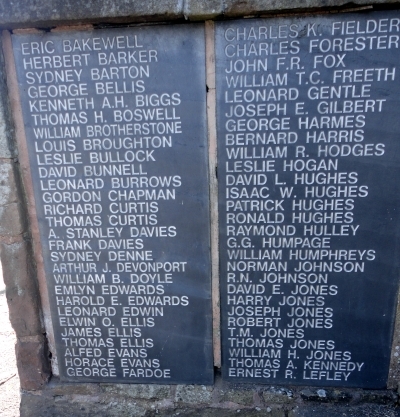 See also the 8 men (below) who are remembered on the War Memorial, on the top of the pillars in front, added at a later date. 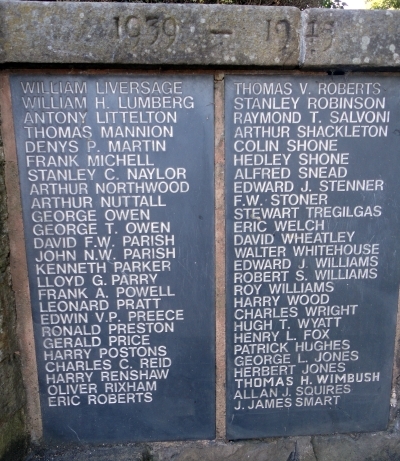 There are only brief details re the Commonwealth War Graves Commission website, but as the Hawarden War Memorial is shortly to be cleaned and improved, I noticed that there are some names on the memorial that have been added and not on the two slate panels. Some of the names were almost covered in moss, which will shortly be removed but I am listing them here. Richard HUGHES – suspect WW2, any help would be appreciated.